To build a particle accelerator the size of a shoe box – this is the goal of a research team being led by FAU and Stanford University in collaboration with eight international partners. 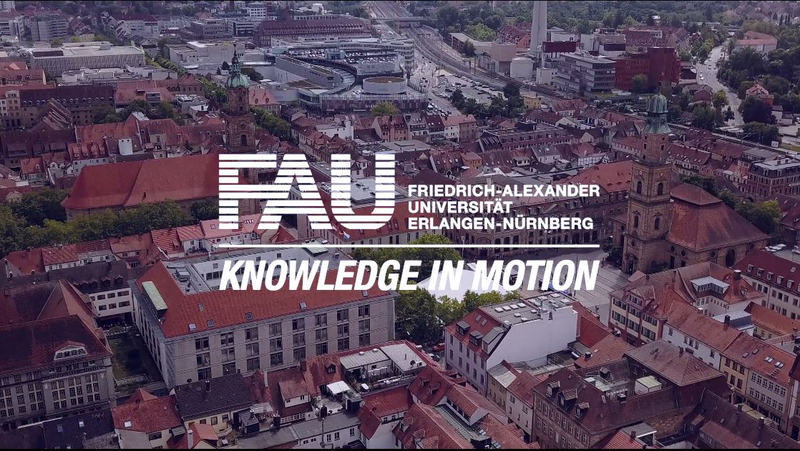 The Gordon and Betty Moore Foundation is funding the project for the next five years with 13.5 million US dollars (approximately 12.5 million euros), around 2.44 million US dollars (approximately 2.26 million euros) of which will be allocated to FAU. Particle accelerators are several kilometres long and costs many millions of euros; large ones cost over a billion euros. There are therefore only a small number of them available to researchers and the short time slots for experiments are allocated according to a strict schedule. However, the high costs and large size could be reduced in the future with the help of the new ‘accelerator-on-a-chip’ method – which would mean a drastic change for scientific research. ‘The impact of shrinking accelerators can be compared to the evolution of computers that once occupied entire rooms and now can be worn around your wrist. This advance means we may be able to expand particle acceleration into areas and communities that previously had no access to such resources,’ explains Prof. Dr. Peter Hommelhoff from FAU’s Chair of Laser Physics, one of the project’s principle investigators. ‘Based on our proposed revolutionary design, this prototype could set the stage for a new generation of “tabletop” accelerators, with unanticipated discoveries in biology and materials science and potential applications in security scanning, medical therapy and X-ray imaging,’ adds co-principle investigator Prof. Dr. Robert Byer from Stanford University. 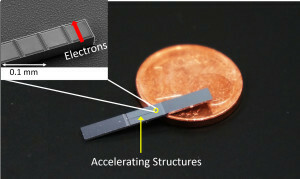 The accelerator-on-a-chip method that the project is using is based on experiments by the two principle investigators. Prof. Hommelhoff and Prof. Byer showed independently of one another that pulses of laser light can be used to accelerate electrons. 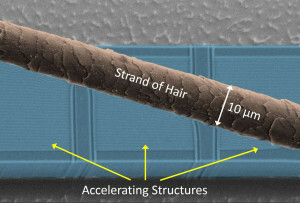 In their experiment Prof. Hommelhoff and his team used the electron beam of an electron microscope, which they directed along the side of microstructured glass at extremely close proximity. By focusing short, intense laser pulses on the electrons through the fine glass structure from the side, they were able to accelerate the electrons. Prof. Byer and his team demonstrated the same effect in a very similar experiment using much higher-energy electrons in a special particle accelerator. This resulted in the electrons being accelerated ten times faster than in conventional accelerators. The findings from the two studies, both published in 2013 in Physical Review Letters (Hommelhoff) and Nature (Byer), could make a new compact particle accelerator possible. Furthermore, the researchers have to find a suitable way of producing the electrons and directing them precisely. This means that the new accelerator will have to include not only a chip-based accelerating component but also components for directing and focusing the electrons – and these components do not yet exist. Finally, the researchers will have to find the best possible design for the microchips so that when they are connected they produce a working particle accelerator in which none of the particles get lost. The accelerator microchip is just one piece of the puzzle when it comes to creating a functioning particle accelerator. The key to success will be either to connect several microchips with different functions in series, allowing the electrons to be accelerated to high energies, or to produce all the required components on one larger microchip. The latter is the approach desired by the researchers. According to Prof. Hommelhoff, whether the finished particle accelerator is actually the size of a shoe box, as small as a matchbox or in fact the size of a packing box is not that important. ‘It is mainly about building a prototype that shows that particles accelerators can be made much smaller than they are currently,’ he explains. The project brings together internationally renowned experts in accelerator physics, laser physics, photonics, nanotechnology and nanofabrication. Alongside FAU and Stanford University, it involves three research centres – SLAC National Accelerator Laboratory in Menlo Park, USA, Deutsches Elektronen-Synchroton (DESY) in Hamburg and the Paul Scherrer Institute in Villingen, Switzerland – one company and five other universities – the University of California Los Angeles, Purdue University in Indiana, USA, the University of Hamburg, the Swiss Federal Institute of Technology in Lausanne and Technische Universität Darmstadt. The Gordon and Betty Moore Foundation is one of the world’s largest private foundations that supports scientific research and technical development, and has invested over one billion US dollars in the past. Further information about the Foundation is available at www.moore.org.